Do you need more space in your home but you cannot afford an expansion or the deed restrictions won’t allow? Do you want more energy efficiency and reduce high energy bills? 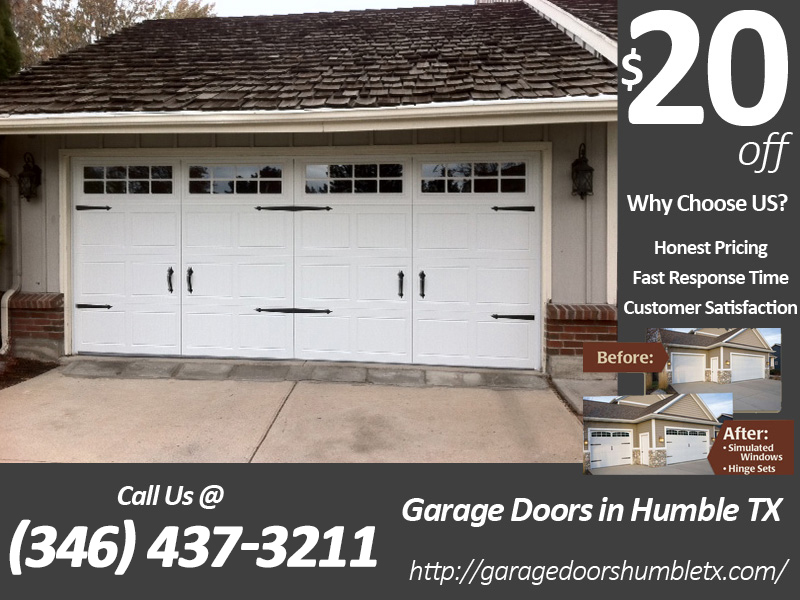 Well, at Garage Doors Humble we can help to convert your garage into the expanded room you badly need. Additionally, we can help you to kiss high power bills goodbye forever. To create room in your garage, we insulate it with high-grade polystyrene material finished with a smooth vinyl. This makes it easy to clean. You have just got yourself a new office, bedroom or expanded living room. For doors whose panels are joined together by hinges, we use a special insulating technique. Insulated garage doors help to keep heat and the cold away hence your air conditioner uses much less energy. Garage doors can be more than just an appliance that secures your car or workshop. They can be used to express your artistic side. We will assist you to achieve this objective. We provide an array of top-quality brands of garage door hinges and rollers. The hinges are quite decorative; they come in different beautifully cut artistic designs. They also come with matching door handles to complete the look. Therefore, the hinges serve their key purpose of anchoring the door and give you great aesthetic value. The rollers are heavy duty and they can withstand over 50, 000 cycles. Springs are perhaps one of the most vital components of your garage door. Therefore, it’s important to have the right size, proper amount of adjustment, and right number of turns. From our wide selection of garage door springs; it is easy to find the right kind. Our highly-skilled technicians will help to get the one that suits your door.